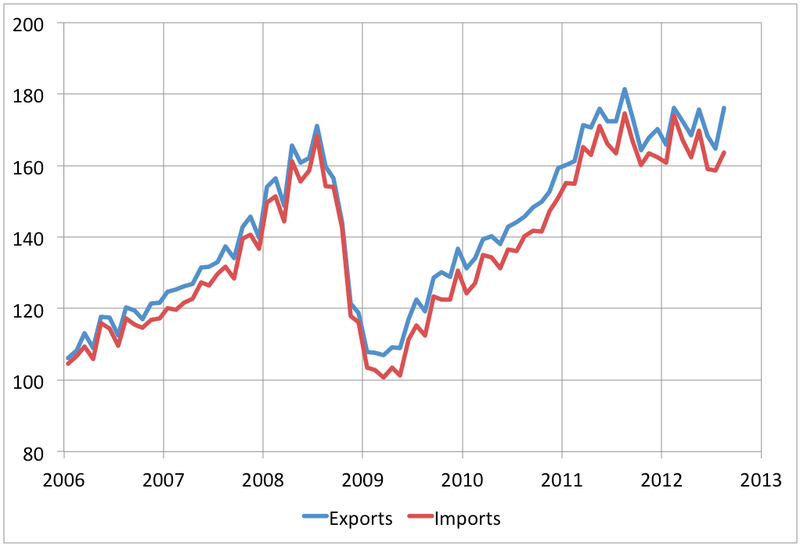 Above is the latest data on global trade: the monthly data come from the WTO and I seasonally adjust them myself. The last data point above is August, but it is very preliminary with only eight of about seventy countries reporting, representing a fifth of global trade. Still, since the imports and exports of those eight countries represent essentially independent samples, it's likely that at least the direction in August is robust. August thus seems to represent some degree of offset for the sharp fall in June. This doesn't change the big picture though - after the 2008 financial crisis, global trade collapsed and then recovered strongly till early 2011. For the last eighteen months, however, it's been basically stagnant. This likely reflects a combination of a sluggish US recovery, a double-dip recession in Europe, and the slowdown in China. The global economy continues to act like an engine firing on only three cylinders. Are you kidding? In terms of C02 it's a 12 cylinders 2 seat convertible in first gear making 100mph. How much would the nearly 10% rise in world oil prices in August affect this? Hi Stuart, first time commenting. Congratulations for this inspiring blog. At sight I think that this monthly global trade series correlates fairly well with oil price, maybe with lag of one or two months. 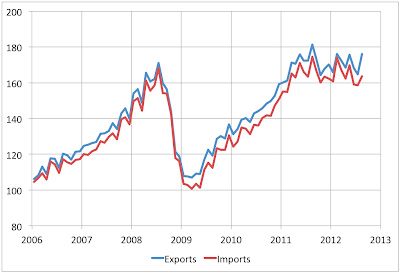 There could be some implications, the obvious one being that economy and thus trade depend heavily on oil supply. Quite a few sets of time series data show a similar pattern. Brent Crude, OK WTI crude. LME aluminium spot price. Newcastle (Aus) thermal coal. Perhaps with the exception that the 2008 pre-GFC peak is higher than the 2011 post GFC peak.